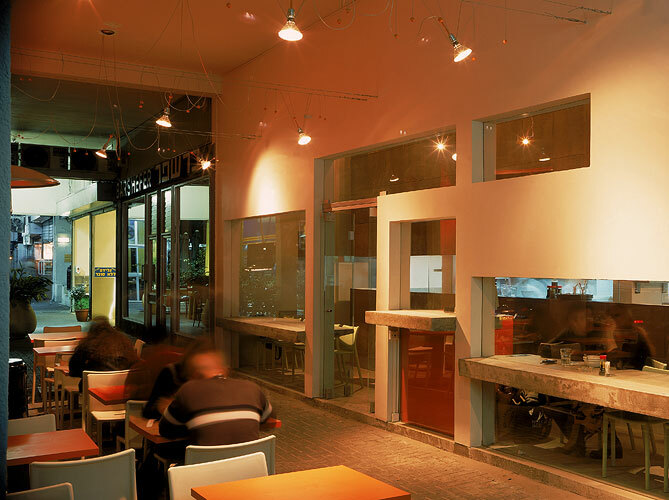 The T- shaped space, is located in the intense arcade of Ibn Gevirol street. The new façade of the bar does not have doors and windows in accordance with tradition. Glass panels, which include floating concrete counters replace the old façade. When cut into geometric shapes of different sizes, the glass panels expose the space towards the arcade and give individual situations a poetic and public expression. Inside the space, a second façade structure was created from panels of cement-board which presents the kitchen and it's fresh produce. The dimensions of the façade, which is long and tall, are reminiscent of a body of a boat with a baggage of sailors, spices and dreams. The clarity of the central structure, the delicate progression of the space, and the plan itself, enable the exit and entrance of "passengers". The space stores and exposes, in a composition of glass, metal and concrete, an impressive arrangement of the preparation of food. Everything which is there exposes. Visuality which hints about the quality of the product, it's preparation and the space in which it is created.